Every month, Team Unwinnable puts together short lists of recommended music, books and games. These lists originally appeared in Unwinnable Monthly 89. If you enjoy what you read, please buy the issue or subscribe. 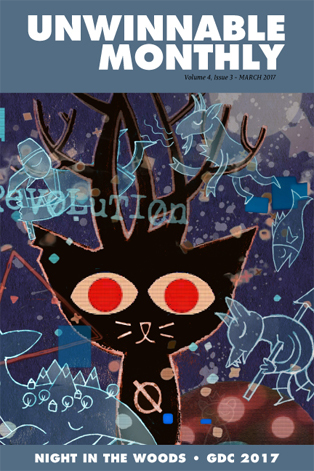 Night in the Woods – a delightful game, featuring great writing, superb animation, post-industrial ennui, a dose of cosmic horror and one twitchy ear. Just go play it. Abzu – Journey never resonated with me as much as it did for some people, but after playing Abzu, I can relate to the sense of awe and wonder for which many praised Journey. Swimming languidly among schools of vibrant fish and hitching a ride on the back of a majestic manta ray conjures a peaceful euphoria, one that kept me smiling all through my undersea adventure. In what other game can you leap out of the water amidst a pod of dolphins before joining a herd of whales as they search for breakfast in the inky depths? Disgaea 5 – I am utterly addicted. MegaSphere – I once caught a glimpse of this colorful, pixelated platformer and decided to give it a shot. While I enjoyed its punishing enemies and seemingly endless levels, I cannot stand for the fact that the demo has no save function. I’m all for difficult games reminiscent of old retro titles but retaining the worst features of these games – of which many gamers seemed to have forgotten about due to nostalgia – was a bad idea. Luckily, the game is still in early access, so hopefully these kinks would be ironed out come its official release date. Pocket Legacy – There is so much that I could be doing instead of playing Pocket Legacy. I can’t explain it. It calls to mind those childhood sliding puzzles that I abhorred, but somehow I am compelled to continue, compelled to slowly eat up my battery life. I should be playing ROM or Night in the Woods, but instead I am playing an wonderfully addictive game about evolution. Kind of. Story of Seasons: Trio of Towns – If you didn’t hear about the weird trademark stuff going on with Harvest Moon and Story of Seasons, Story of Seasons is actually Harvest Moon. The series’ newest installment further expands and refines its features, making it the best farming sim yet. It was the first game I’ve ever pre-ordered, and I’m glad I did! Nier: Automata – In its first ten minutes, Nier: Automata already has the confidence to throw different genres, play-styles, and colossal bosses at me, assuming I’ll cope. Four hours in, its mix of Platinum’s trademark character action, open-world wandering and heavily Dark Souls-inspired systems (which fit perfectly into a twisted tale of replaceable androids guarding a dead world) is an intoxicating tidal wave driving me towards inevitable revelation. I can’t wait to see where this ride goes! Game: Guitar Hero Live – The iOS version of this game and guitar was going for a song (see what I did there? ), so I picked it up to play on my Apple TV. I dig the new fret button layout, which does a better job simulating chord positions, but I really love the live footage of the audience cheering and/or booing for me. Especially the booing. It’s genuinely hilarious. Lego Star Wars: The Force Awakens – I’ve now played every Lego Star Wars videogame and I think it would have been okay if I hadn’t. While there’s a certain fascination in getting to experience the original actors voicing the harmlessly irreverent Lego take on Star Wars action, the novelty wears off quickly. Staging the early Lego videogames as pantomime was an inspired response to data (and probably budget) limitations. Sometimes less is more. Clash Royale – A co-worker got me hooked on this game months ago and I have been playing it on and off for a bit now. I like the card based wargaming but it’s almost impossible to find the rare and legendary cards without paying money. The Legend of Zelda: Breath of the Wild – This game feels endless and I wish it was. Two weeks into playing it I can honestly say that this is, so far, the best experience I have ever had playing a game and a console for that matter. The hardware feels amazing and is flexible (considering I usually have a toddler “helping”) and the gameplay is just beyond consuming. Bravo Nintendo. Horizon: Zero Dawn – Horizon feels like a more focused, interesting Tomb Raider. I’m not much for some of the names, but it’s a game that actually makes me want to peel back the layers of its story. I want to know what happens next and I’ll happily hunt robots with a bow and arrow to do that.